Swarovski Crystal Limited Edition Elephant – Cheap, cheap! Swarovski crystal fanatics will be intrigued to hear about a terrific deal at Crystal Exchange America! 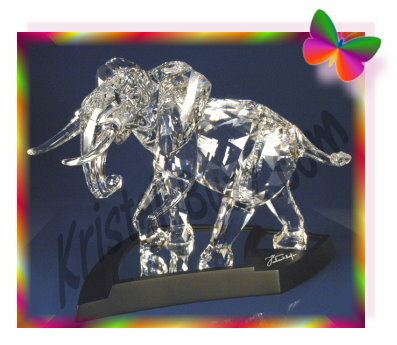 This retired Swarovski dealer has an exceptional offer on the Swarovski NLE Elephant. First, some background on this special crystal sculpture figurine. The Limited Edition Elephant was produced in 2006, with a maximum production of 10,000 units. The Elephant originally retailed for $3250 during the time it was available from Swarovski. This Swarovski NLE was designed by Heinz Tabertshofer and is identified with the brand’s product number 9100 000 034 and system number 854 407. The Elephant has a length of approximately 11”. It came with a mirrored stand for display, gloves, a certificate with a matching number to the laser-engraved crystal, and is encased in a royal blue locking suitcase. So, hearing that the Swarovski Limited Edition Elephant was limited to 10,000 pieces, collectors would likely think this is a ‘must have’ figurine for their collection. I looked quickly at the online auctions and found none available under $3500, and the most recent completed sale was at $3599 including shipping. Given the additional information on this Limited Edition Elephant, Swarovski collectors may find it terrific news that Crystal Exchange America has a client willing to sell for $2000 + shipping! This particular Swarovski Elephant is on site and inspected. The only flaw found is that there is a small chip on the underside of the back left foot, but it cannot be detected when displayed. If this attractive price on the Swarovski Elephant is enticing enough, and you want to purchase, add this Swarovski Elephant to your cart, then proceed with the checkout process to ensure that you don’t miss out. After this one has sold, the next lowest price Elephant is over $5100, more than $3100 higher. Swarovski Longwang Dragon – the Newest Crystal Myriad Swarovski Crystal Limited Online Edition Lime Panther Officially Released!